cloud (gray) of two electrons (yellow). An atom (Greek άτομον from ά: non and τομον: divisible) is a submicroscopic structure found in all ordinary matter. Originally the atom was believed to be the smallest possible indivisible particle of matter. Later, atoms were found to be composed of even smaller subatomic particles. Consisting of a positively charged nucleus surrounded by a cloud of negatively charged electrons, atoms exhibit the duality of positivity and negative that is characteristic of all existing beings. Atoms are the fundamental building blocks of matter. They can be classed into elements, and combine in definite ratios to form compounds through ionic or covalent bonding. In chemical reactions they are neither created or destroyed, and are said to be conserved. neutrons, which have no charge. The protons and neutrons together form the nucleus of the atom; a small, dense, positively charged region at the center of the atom where most of the mass of the atom resides. The protons and neutrons are themselves composed of smaller particles called quarks. The quarks, and the nucleus itself, are held together by the strong interaction. This is one of the four interactions of the physical universe. The electrons surround the nucleus in a diffuse region of negative charge that is much larger than the nucleus itself and is responsible for the size of the atom. Quantum mechanical calculations show us that these electrons have an orbital structure that is responsible for the physical and chemical properties of the atom. Each type of elementary particle also has a corresponding antiparticle (see particle physics). Thus atoms of antimatter can potentially form, composed of antielectrons, antiprotons, and antineutrons. The size of an atom is not easily defined since the electron orbitals just gradually go to zero as the distance from the nucleus increases. For atoms that can form solid crystals, the distance between adjacent nuclei can give an estimate of the atom size. For atoms that do not form solid crystals other techniques are used, including theoretical calculations. As an example, the size of a hydrogen atom is estimated to be approximately 1.2×10-10m. Compare this to the size of the proton which is the only particle in the nucleus of the hydrogen atom which is approximately 0.87×10-15m. Thus the ratio between the sizes of the hydrogen atom to its nucleus is about 100,000. Atoms of different elements do vary in size, but the sizes are roughly the same to within a factor of 2 or so. The reason for this is that elements with a large positive charge on the nucleus attract the electrons to the center of the atom more strongly. Atoms are generally classified by their atomic number, which corresponds to the number of protons in the atom. The atomic number defines which element the atom is. For example, carbon atoms are those atoms containing 6 protons. All atoms with the same atomic number share a wide variety of physical properties and exhibit the same chemical behavior. The various kinds of atoms are listed in the periodic table in order of increasing atomic number. The mass number, atomic mass number, or nucleon number of an element is the total number of protons and neutrons in an atom of that element, because each proton or neutron essentially has a mass of 1 amu. The number of neutrons in an atom has no effect on which element it is. Each element can have numerous different atoms with the same number of protons and electrons, but varying numbers of neutrons. Each has the same atomic number but a different mass number. These are called the isotopes of an element. When writing the name of an isotope, the element name is followed by the mass number. For example, carbon-14 contains 6 protons and 8 neutrons in each atom, for a total mass number of 14. 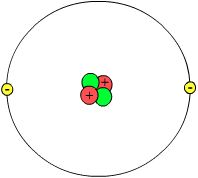 The simplest atom is the hydrogen atom, which has atomic number 1 and consists of one proton and one electron. The hydrogen isotope which also contains 1 neutron is called deuterium or hydrogen-2; the hydrogen isotope with 2 neutrons is called tritium or hydrogen-3. The atomic mass listed for each element in the periodic table is an average of the isotope masses found in nature, weighted by their abundance. The chemical behavior of atoms is largely due to interactions between electrons. Electrons of an atom remain within certain, predictable electron configurations. Electrons fall into shells based on their relative energy level, which is usually visualized as their mean distance from the nucleus. The electrons in the outermost shell, called the valence electrons, have the greatest influence on chemical behavior. Core electrons (those not in the outer shell) play a role, but it is usually in terms of a secondary effect due to screening of the positive charge in the atomic nucleus. The atomic orbital wavefunctions of hydrogen atom hydrogen. The principal quantum number is at the right of each row and the azimuthal quantum number is denoted by letter at the top of each column. To determine the electron capacity of a shell, the formula 2n ² is used, where n is the shell number or principle quantum number. Electrons fill orbitals and shells from the inside out, beginning with shell one. Whichever occupied shell is currently most outward is the valence shell, even if it only has one electron. The reason why shells fill up in order is that the energy levels of electrons in the innermost shells are significantly lower than the energy levels of electrons in outer shells. So if the inner shells were not completely full, the electron in an outer shell would quickly "fall" into the inner shell (with the emission of a photon that would carry away the difference in the energy). The number of electrons in an atom's outermost valence shell governs its bonding behavior. Therefore, elements with the same number of valence electrons are grouped together in the periodic table of the elements. Group (i.e. column) 1 elements contain one electron on their outer shell; Group 2, two electrons; Group 3, three electrons; etc. As a general rule, the fewer electrons in an atom's valence shell, the more reactive it is. Group 1 metals are therefore very reactive, with caesium, rubidium, and francium being the most reactive of all metals. Democritus and Leucippus, Greek philosophers in the fifth century B.C.E., presented the first theory of atoms (atomism). They held that each atom had a different shape, like a pebble, that governed the atom's properties. Dalton and Avogadro rediscovered the works of Democritus and Leucippus and suggested in the nineteenth century that matter was made up of atoms, but they knew nothing of their structure. This theory was conflicting with the theory of infinite divisibility, which states that matter can always be divided into smaller parts. The controversy settled down in 1911 when Perrin discovered the meta-particle we nowadays call an atom. Jean Perrin thought that he had found the "atomos" that Democritus talked about and so named his particles atoms. Through this time, atoms were thought to be the smallest possible piece of matter. However, it was later shown that atoms are made up of subatomic particles. Thomson's experiments discovered the electron, the first of the subatomic particles to be discovered. This showed that atoms are actually divisible, and not the indivisible "atomos" Democritus talked about. Work on radioactivity toward the end of the nineteenth century also hinted at the divisibility of atoms. Physicists later invented a new term for indivisible units, namely elementary particles since the word atom had already been taken and come into common use. At first, it was believed that the electrons were distributed more or less uniformly in a sea of positive charge (the plum pudding model). However, an experiment conducted a few years later by Rutherford demonstrated that atoms are mostly empty space, with a lot of mass concentrated in a nucleus. In the gold foil experiment, he shot alpha particles (emitted by polonium) through a sheet of gold. He observed that most of the particles passed straight through the sheet without deflection (striking a fluorescent screen on the other side), but that, surprisingly, a small number were bounced right back (having come close to a nucleus). This led to the planetary model of the atom, in which the electrons orbited the nucleus like the planets orbiting the sun. The nucleus was later discovered to contain protons, and further experimentation by Rutherford found that the nuclear mass of most atoms surpassed the number of protons it possessed; this led him to postulate the existence of neutrons, whose existence would be proved in 1932 by James Chadwick. Later, experiments by Max Planck and Albert Einstein demonstrated that energy is transferred in tiny fixed amounts known as quanta. This led Bohr to propose an updated model, wherein the electrons orbited the nucleus in fixed circles. Because their energy could only change by fixed quantities, they couldn't move closer to or farther from the nucleus in spirals; they could only make quantum leaps from one circle to the next. The study of atoms was done by largely indirect means through the nineteenth century and early twentieth century. In recent years, however, new techniques have made the identification and study of atoms easier and more accurate. The electron microscope, invented in 1931, has allowed pictures to be taken of actual, individual atoms. 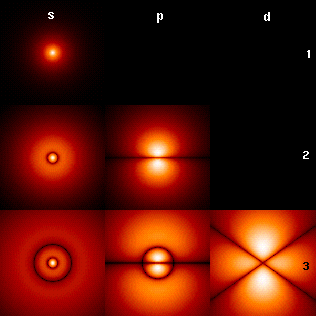 Atomic force microscopy is another technique by which individual atoms can be visualized. Methods also exist to identify atoms and compounds. Elemental analysis allows the exact identification of the types and amounts of atoms in a substance. All links retrieved April 27, 2016. All About Atoms Jefferson Lab. How Atoms Work by howstuffworks. This page was last modified on 27 April 2016, at 16:44.